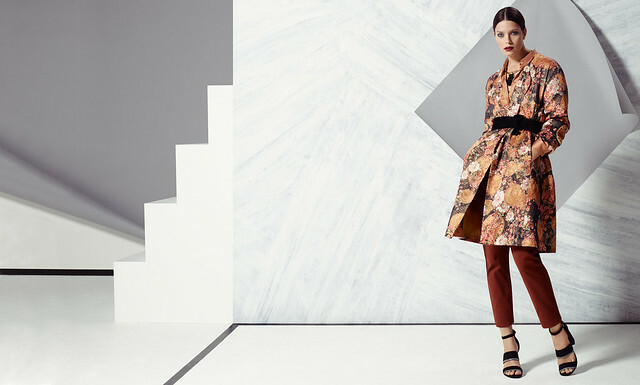 Spring Summer 15 sees Marks & Spencer continue on its style journey; championing the contemporary and celebrating the classic through a refined and confident representation of the new season. Simplicity and pared back styling define the tone of the Spring Summer 15 collections, as the seasons key trends are elegantly presented through a considered edit.The collection has a real 70's vibe which is a trend seen on the catwalk from the likes of House of Holland, Tommy Hilfiger and Prada, I'm really looking forward to seeing more if it arrive in store. Red magazine’s editor-in-chief, Sarah Bailey chose some of her favourite items from the new collection if you want to take a look head over here but I've shared some of my top picks below. Elevating the casual; denim and enriched blues are sartorially explored, as the neutral is redefined for a fresh and feminine aesthetic. Confident and refined with a sleek utlity edge; a tonal pallette punctuated by monochrome details illustrate the simplicity of the linear. S U M M E R O F L O V EA fusion of relaxed tailoring and subtle florals sees a sultry retro revivial that champions tactile suedes and sunset hues; embodying the spirit of the era. An Eastern sensibility informs this modern silhouette as ornamental prints and sculpted separates are elegantly constructed. A romantic narrative veers from the dramatic to the flirtatious; as heavy lace meets peek-a-boo sheers, in a vivid feminine collision. Products will be arriving online and in store from February onward. M&S have really come on in leaps and bounds recently with their fashion lines. Some lovely stuff in this post.